WOW! 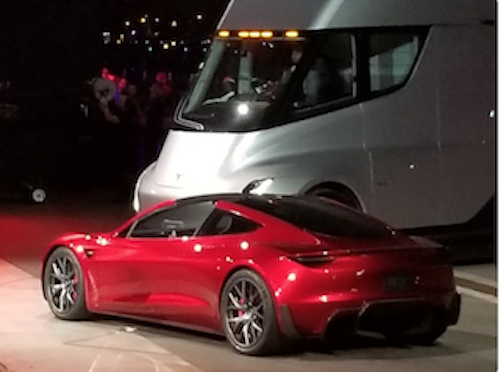 Musk was right; he did blow everyone's mind at the truck launch last night in California. People are not talking about the new truck launched though, they are talking about the launch of the new Roadster. 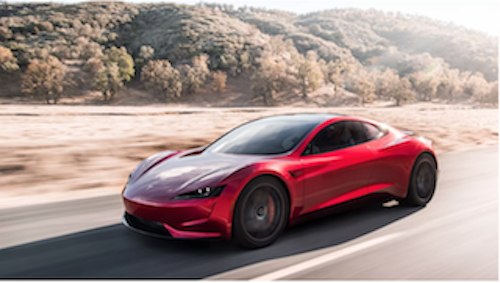 I am amazed that they managed to keep the development of the Roadster out of the media. "Production begins 2019! Which means you'll get your truck in 2037 if you order tonight. . . . And Elon's off the stage!. . . . Well that's it! Alex, please tell me you're currently plotting a truck heist. . . . Doing the presidential thing, shaking hands with those in the crowd. . . . And, all the lights just went out. . . . Now's my moment! . . . HOLD ON FOLKS. . . . A SPORTS CAR JUST ROLLED OUT OF A SMOKING TRUCK. . . . What. Is. Happening. . . . Is this the Roadster 2?. . . It looks like a sexed up mix of the Roadster and Model S . . . . It was in the truck! This is the coolest product reveal of all time. . . ."
It is no secret that Tesla spends more money than comes in their front door through sales. As someone pointed out on Twitter, launching an expensive sports car and having people pay for it up front is a great way to raise short-term interest-free funding. Moving onto the truck, which is why everyone attended the event. The trucking industry is all about efficiency and ease of use which can only be tested in real life operations. From the presentation, it looks like Tesla has reached a new level of battery efficiency, which will allow the trucks to go 400 miles on a 30-minute charge, and 500 miles on a full charge. Having such range off such a short charge, you could see trucking companies install charging stations at delivery points. The truck arrives, plugs into the charging station and then offloads. Once the offload is complete, the truck is ready to do another 400 miles - This is Tesla's big new all-electric truck - the Tesla Semi. Market Scorecard. Stocks had a great day out yesterday, US stocks had their biggest gains in two months. The Dow was up 0.80%, the S&P 500 was up 0.82%, the Nasdaq was up 1.30% and the All-share was up 0.62%. Taste announced a monster rights issue yesterday, raising R398 million; their current market cap is around R350 million. The new Starbucks in Melrose Arch is amazing, it is a place that you want to spend time in.